UPDATE: Go to Matt Sheffield's open thread for current developments. 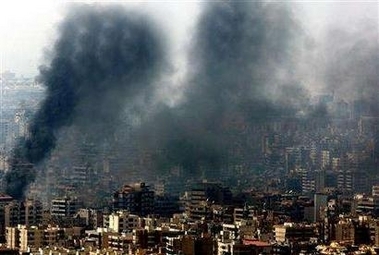 Last night's report by Charles Johnson of Little Green Footballs that a "Beirut burning" photo that was clearly and clumsily doctored with Photoshop editing tools had made it way onto the wires from Reuters has morphed into what must be considered a full-blown scandal that should, by rights, shake the news service and other "Mainstream" Media outlets to their very foundations, and force them to reexamine how they conduct and control their photojournalistic efforts around the world. Fox News’s Neal Gabler was on quite a roll on Saturday's "Fox News Watch." Apart from taking on Mel Gibson as reported by NewsBuster Mark Finkelstein, he also went after conservative columnist Michelle Malkin referring to her as an "opinion monger" (video to follow). UPDATE: As commenter "Sua Sponte 75" noted, Reuters has issued a "Picture Kill Advisory" (link is to Michelle Malkin, as original PKA appears to have been moved) and has admitted altering the photo. Drudge is currently linking to the story at the very top of his page. To the extent that an organization like Reuters cares about such things, it appears that it has been humiliated. Commenter "Ten7s" asks a reasonable question -- "Makes me wonder how much deft photo manipulation gets printed in the media." Indeed. Every once in a while you want to tell yourself that media bias is accidental and not deliberate, a sort of "they can't help themselves" phenomenon. At CNN, the moral relativism never ends. In the wake of shootings by a Muslim at a Seattle Jewish center that left one person dead and others injured, CNN somehow managed to equate the fears of American Jews that there could be other such incidents . . . with the fears of American supporters of Hezbollah. The focus of the 'Safe at Home?' segment narrated by CNN's Kelli Arena on today's Saturday Morning show was indeed the aftermath of that Seattle shooting, and how Jewish groups around the country are expressing fears and taking precautions. But you could almost hear the CNN producer's gears grinding: "Wait! We can't have a segment that focuses exclusively on Jewish fears. Quick: get me some balance!" What CNN came up with was an interview with Rami Nuseir, an Arab-American activist. CNN's Arena started the relativistic slide by claiming that the FBI's program of reaching out to Arab-American leaders for help in identifying potential threats has 'backfired': "Arab-Americans feel as though they are constantly under suspicion." If the Israeli "massacre" at Qana turns out to be yet another fraud, you can count on the media to quietly let the story slip away, a contrast from the media fireworks that were present when the story was announced. A simple "we were wrong" is is much more embarrassing than hoping everyone will forget the original hype. Pipeline News has a good summary of the latest information. The death count at Kana was wildly inflated and reported as fact without any ability of the media to confirm its figures. The Israeli Air Force was not responsible for the collapse of the building in question. Hezbollah had built the now demolished structure directly over an ammunition dump and was firing rockets South into Israel at the time of the IDF air strike. As the world watches events unfold in the Middle East from the comfort of their living rooms, evidence is mounting that Hezbollah is using the media in a fashion that would make Nazi propaganda minister Joseph Goebbels extremely proud. Such an assertion has far reaching implications to be sure, as it points an accusatory finger at the behavior of the American press as well. Supporting this contention is a paper written in 1948 by Yale psychology professor Leonard W. Doob entitled “Goebbels’ Principles of Propaganda.” In it, Doob enunciated the famed Nazi’s nineteen-point plan for the effective use of the media to advance Germany’s goals. For Fox News fans who like Alan Colmes almost as much as they like Eleanor Clift or Helen Thomas, Wednesday night’s “Hannity and Colmes” was a blessed event (hat tip to Expose the Left with a video link to follow). And the questions surrounding the air strike at Qana keep coming. This photo was first noted as a possible staged photo by A.J. Strata on July 31st. What Does the Hezbollah Propaganda Machine Say About American Media? The Israeli newspaper Haaretz did a report Thursday (hat tip to Drudge) on the Hezbollah propaganda machine. As one reads the revelations about how this terrorist group uses the media to affect opinion in Lebanon, Israel, and across the globe, it is difficult not to wonder what impact similar efforts by liberal press representatives in America is having on the war in Iraq as well as the war on terrorism. If Hezbollah-run media are to be believed, then 35 Israel Defense Forces soldiers were killed or wounded in Aita Shaab, militants downed an Israeli helicopter and destroyed a house in which IDF soldiers were hiding, and IDF troops are always hit in the back because they are running away. 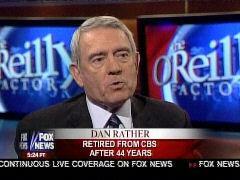 Appearing on FNC's The O'Reilly Factor Wednesday, former CBS News anchor Dan Rather conceded there's a "problem" with America's media in its treatment of Hezbollah and Israel with "moral equivalence," even including himself as part of the problem. An email was sent out to Associated Press staffers that praised the work of its photographers during the Israeli-Hezbollah conflict. There's even a cash prize of $500 dollars that apparently will get split eight ways. The photographers who took the pictures of dead children in Qana will take part in the reward. Is this what it takes? If we paid them $500 dollars, maybe photographers in the region would take pictures of terrorists hiding behind human shields. Rachel Neuwirth writes in The American Thinker that the media have made the job of the terrorists much easier as the media provide the version of reality the terrorists hope to convey. The media never blame the terrorists who hide behind civilians who get killed, and Neuwirth writes that therefore the media are "directly complicit in enabling this tactic to continue and for more Lebanese civilians to be killed."